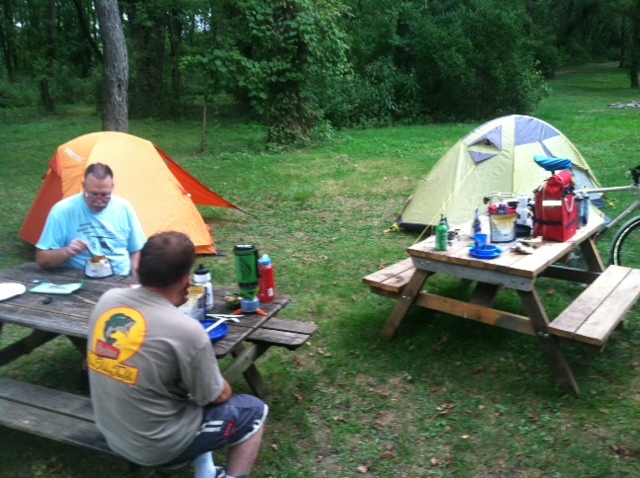 Rich Oettinger, one of the mechanics at the Century Cycles store in Peninsula, took a 2-day bicycle camping trip this week. We've written about these "sub 24-hour overnights" before, including this article that appeared in Ohio Sports & Fitness Magazine a couple of years ago. My friend Brian and I are riding our bikes from Pittsburgh to Washington, DC on the Great Allegheny Passage and C&O Canal Towpath Trails in a few weeks. So, we decided to do a 2-day ride to make sure everything worked right and we had everything we needed for the trip, i.e. stoves, food, tent, etc. My friend (an Peninsula store customer) Pete also came along with us. This is a great trip for people who want to get their feet wet in bicycle touring. 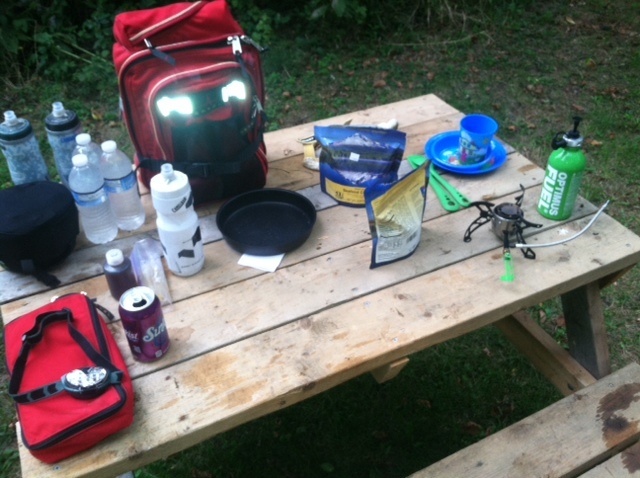 You don't need a lot of gear to do this type of trip. You can camp or stay in a motel, and eat in restaurants if you choose. 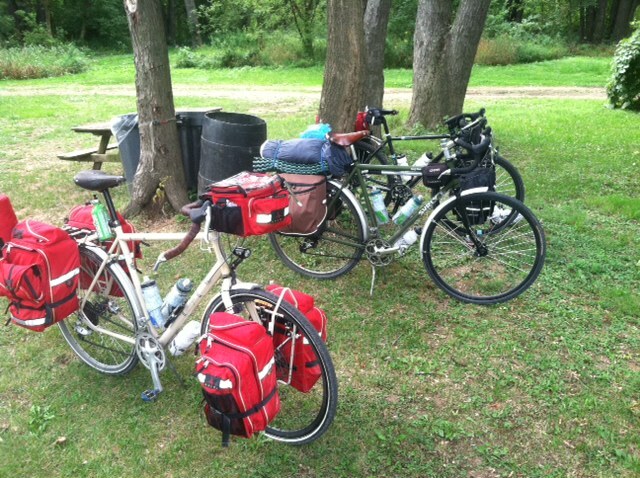 Our bikes were touring and cyclocross bikes--my Raleigh Sojourn, Pete's Surly Long Haul Trucker, and Brian's Raleigh Roper--with racks to carry our gear. They varied in total weight from 91 pounds (mine) down to 63 pounds. It sounds heavy, but was not as bad as you think. I had my full gear that I'll need for the Pittsburgh-DC trip, because I wanted to see how it all felt to carry, but Pete had only a tent, sleeping bag and pad, and a plate and fork to share our food. 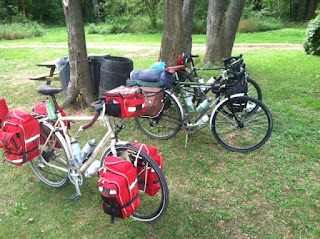 We rode from the Botzum Trailhead on the Towpath Trail to NTR Canoe Livery in Bolivar (www.canoe-ohio.com). It is about 55 miles one way. Down near Massillon, the trail gets a little bumpier and rougher than in Summit County. We took 5-minute breaks every 1-1/2 hours or so to see some of the sights. 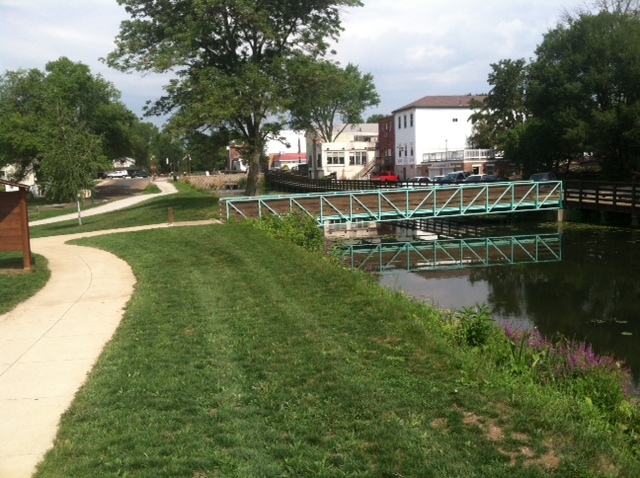 The ride is all on the Towpath Trail, except for some short street detours through downtown Massillon, and about 2 miles on the road to get from where the trail ends and into the village of Bolivar. The locks in downtown Akron are one of my favorite things to see. I also love riding across the floating bridge on Summit Lake. The city of Canal Fulton is very beautiful; don't forget to stop at the Cherry Street Creamery for ice cream--the Towpath Trail runs right beside it. Take a trip of your own and see what is your favorite part of this wonderful trail. 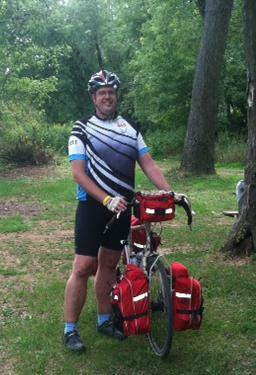 Have a great ride to DC, be safe! I have often wondered why there were no campsites or hotels near Peninsula, or any where else on the trail. It would seem like an obvious good idea for bikers who would like to traverse the complete trail. I know there is a hostel near Boston I believe but it isn't on the tow path. I have rode the trail from my home to Harvard Rd and south to Bath Road in Akron and back to my home, about 65 miles round trip but I don't dare ride much beyond that because there is no guarantee I could complete he trip, if there were a campground or a motel along the trail I would be able to stretch this into a 2 or even 3 day sight seeing ride. Surely I'm not the only one who would love to ride the towpath and do a little sight seeing for a couple of days. As for you guys riding the GAP, best of luck, I envy you. I have a dream to ride that trail but I'm getting up there in years, I don't know if I will make it or not. Let us know how the grade uphill is, I heard that it wears you down after a while.